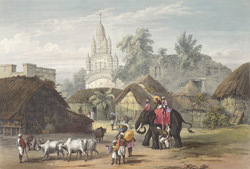 This coloured lithograph is taken from plate 24 of Sir Charles D'Oyly's 'Views of Calcutta and its Environs'. Governor-General Lord Wellesley set up a committee for the improvement of Calcutta in 1803. One of its achievements was the construction of the Strand Road, which ran along the River Hooghly from Chandpal Ghat northwards. Other ghats - built-up embankments forming landing-spots for boats - were developed along its span. Note the gourds and melons in front of the hut, a constant feature of rustic homes in Bengal. Note also the elephant: banned from the centre of Calcutta "on account of the frequent accidents which they occasion by frightening the horses".